Researchers based millions of kilometres from Mars have unveiled new evidence for how contemporary features are formed on the Red Planet. A study led by Natural Sciences PhD candidate, Lauren Mc Keown, with Profs Mary Bourke and Jim McElwaine (Durham University), describes phenomena unlike anything seen on Earth. Innovative lab-based experiments, carried out by Lauren of the Earth and Planetary Surface Process Group in the Department of Geography, on carbon dioxide (CO2) sublimation – the process by which a substance changes from a solid to a gas without an intermediate liquid phase – suggest the same process is responsible for altering the appearance of sand dunes on Mars. Mars’ atmosphere is composed of over 95% CO2, yet we know little about how it interacts with the surface of the planet. Mars has seasons, just like Earth, which means that in winter, a lot of the CO2 in the atmosphere changes state from a gas to a solid and is deposited onto the surface in that form. The process is then reversed in the spring, as the ice sublimates, and this seasonal interplay may be a really important geomorphic process. This process may explain Martian sand dune “Sand Furrows” - elongated shallow, networked features that form and disappear seasonally on Martian dunes. 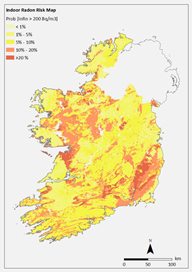 Research led by geologists Javier Elío and Quentin Crowley from the School of Natural Sciences at Trinity College Dublin, found that including geological data, such as bedrock and glacial geology, subsoil permeability and sub-surface permeability in relation to groundwater with existing indoor radon concentration measurements, provides a detailed picture of the radon risk facing Ireland’s public. Around 10% of Ireland’s population (approximately 460,000 individuals) is exposed to radon levels that exceed the referenced safe level. At a large-scale level, this analysis breaks Ireland into three risk categories: high (HR), medium (MR) and low (LR) based on the probability of having an indoor radon concentration level above the reference level of 200 becquerels per cubic metre (Bq/m3). The probability of living in a home with a concentration level above this is calculated to be 19% in HR areas, 8% in MR areas and 3% in LR areas. The 19% of homes in high risk areas will have indoor radon concentrations higher than the national reference level, and that remedial action should be taken. Moderate and low risk areas will have a lower proportion of homes above the indoor radon national reference level, but even some homes in the low risk category will have elevated radon levels. A new radon risk map shows the probability of indoor radon concentrations exceeding the reference level of 200 becquerels per cubic metre. The teeth of any animal give a clue as to whether it’s a meat eater or a vegetarian. But, according to collaborative research from scientists at Trinity College Dublin, University College Cork, St Andrews University, and Imperial College London, in order to determine whether it eats live prey or dead meat, you have to go beyond teeth and look at many other aspects of its biology. The right mix of biological ingredients make a good scavenger, but they can live in vastly different environments and look very different from one another. Any sense that allows detection of an unmoving meal is a particularly useful trait for a scavenger – especially when it is coupled with an ability to search far and wide for scattered food. Interestingly, the same useful meat-thieving traits can and do work in different environments; albatrosses regularly take dead squid floating on the sea surface, for example; these birds have so many similarities to vultures that they have been dubbed the “vultures of the sea”. Some environments are not suited to scavenging, including those that contain little potential food, or fast-moving rivers where bodies soon become swept away. In fact, meat-eating species are spread along a gradient and we can think of different species in terms of where they sit on a scavenging scale, on which those best suited to the lifestyle appear at one end, and those ill-suited to scavenging are sited at the other. This was the idea set out by the research team, whose work shows that you can position any animal – extinct or alive -- on this scale, based on its biological traits and its environment. 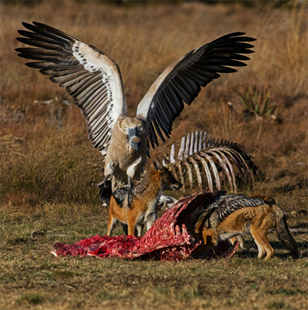 Vultures and jackals are expert scavengers, and are seen here squabbling over a dead carcus. Initial results from a collaborative EU research project suggest that diets that draw protein from plant sources may hold the key to fighting hunger and global warming in years to come. 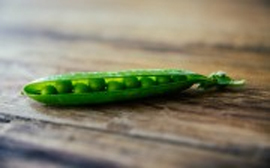 If we grow and consume more legumes, such as peas, beans and lentils, we will benefit from their higher nutrient density and simultaneously reduce the environmental costs associated with food production. 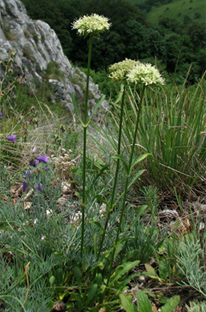 Ecologists from School of Natural Sciences, led by Dr Anna Mária Csergő and Professor of Zoology Yvonne Buckley, used a big data approach to test the links between climate suitability and persistence strategies for nearly 100 populations of over 30 species of trees and herbs growing on 3 continents and 16 countries across the globe. Some of these data were gathered over the duration of a decade, allowing the ecologists to pinpoint and trust emergent patterns linked to climate change with greater confidence. What they found is that while many species are able to persist in less favourable climate conditions, those same species often do so by adopting last-stand strategies such as shrinking in size and temporarily suspending reproductive and growth effort. This merely helps them to survive instead of thrive in these less favourable environments. The big-picture message here is that these species – which include a soapwort and a poppy found in the mountains of Europe, grey alder found in North America and the African mahogany – are more vulnerable to further changes and to disturbances such as wildfires or pest outbreaks. Many such disturbances are more likely now than in years gone by due to changing climates. One of the next steps is to design management strategies to help support these species and to safeguard the ecosystem services that they provide us. The spatule-leaved soapwort (Saponaria bellidifolia) resorts to shrinkage to persist in less favourable climates. A comprehensive report analysing consumption practices and the way we live shows that understanding and transforming behaviour will be the key to meeting Ireland’s sustainability changes. Tailored policy approaches are required, as consumption varies by age, gender, and socio-economic background -- but research confirms huge gains are possible in reducing water use and waste. The CONSENSUS research team, funded through the Environmental Protection Agency’s (EPA) Research Programme 2014 – 2020 and led by Professor of Geography, Environment and Society at Trinity College Dublin, Anna Davies, launched its report: CONSENSUS II: Segmentation, Experimentation and Biographies for Sustainability at a gathering of international sustainability experts at the National University of Ireland Offices in Dublin. The CONSENSUS project developed and tested novel ways to better understand and respond to the complex challenges created by household consumption: lifestyle segmentation, mobility biographies and home-based living laboratories (HOMELABS). 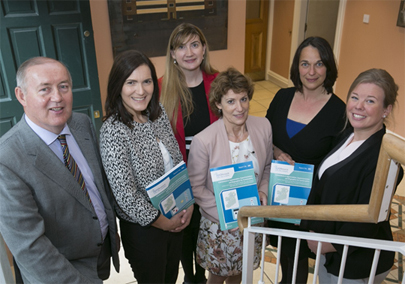 Pictured at the launch are, (l to r): Michael O’Cinneide, Director, EPA, Professor Anna Davies, Trinity, Dr Frances Fahy, NUIG, Dr Dorothy Stewart, EPA, Professor Henrike Rau, Munich, Mary-Jo Lavelle, NUIG. The team studied rocks filling one of the largest preserved impact structures on the planet, located in Sudbury (Ontario, Canada). The ‘bolide’ hit the Earth here 1.85 billion years ago and excavated a deep basin, which was filled with melted target rocks and, later, with jumbled mixed rocks full of tiny volcanic fragments. The key finding of the research, is that the composition of the volcanic fragments changed with time. Right after the impact, volcanism is directly related to melting of the Earth’s crust. However, with time, volcanism seems to have been fed by magma coming from deeper levels within the Earth. This is an important finding, because it means that the magma sourcing the volcanoes was changing with time. Therefore, the effect of large impacts on the early Earth could be more serious than previously considered. Photomicrograph of a vesicular green shard from the Onaping Formation of the Sudbury impact basin. Image credit: Paul Guyett, Trinity College Dublin.